France's biggest carmaker, PSA Peugeot Citroen, has sacked its chairman weeks after it announced huge losses and a massive programme of job cuts. The firm said it had removed Christian Streiff because of the "extraordinary difficulties" the motor industry faces. He will be replaced by Philippe Varin, current chief executive of the Anglo-Dutch steel group Corus. Consumer demand for cars has dropped since the credit crunch, plunging the sector into crisis. The carmaker's supervisory board chairman, Thierry Peugeot, announced the departure of Mr Streiff in a statement. "Given the extraordinary difficulties currently faced by the automotive industry, the supervisory board decided unanimously that a change in the senior leadership position was necessary," he said. Mr Streiff, 54, a former boss of aeroplane maker Airbus, had been in the post for little more than two years but had been suffering from ill-health. Mr Varin will take over as Peugeot chief on 1 June, with an interim boss being appointed until then. "I am confident that under the leadership of Philippe Varin, the group will be able, with all the teams, to unlock its potential," said Mr Peugeot. One in 10 French workers are employed in the car industry, and President Nicolas Sarkozy has promised that the sector will not be allowed to collapse. The government has already agreed to lend Peugeot Citroen 3bn euros ($4bn; £2.8bn), with a similar loan being agreed for rival firm Renault. 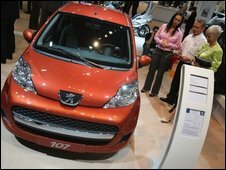 The firm, Europe's second-biggest car maker, reported an unexpected 2008 net loss of 343m euros after its sales slumped. It plans to cut more than 11,000 jobs this year.